The irregular work envelopes of traditional jointed articulating arms may require redesign of existing workspaces. SCARA and articulating arm robots might be the most recognizable form of robot on the market today but look to gantry robots for getting the big jobs done in the least amount of space. Gantry robots also called Cartesian robots are almost ubiquitous with automation but for reasons beyond the scope of this article here are not quick to be regarded as serious robots. Due to their simple design, low cost and scalability and the myriad of motor and control software solutions, this is changing. Fact: Cartesian design robots will usually produce the best accuracy. 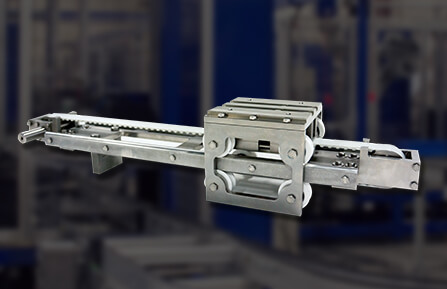 Gantry robots can utilize an entire cubic work envelope of 96% of their space and size. A Cartesian robot has three axes. Like their namesake and more recognizable giant cousins, the gantry crane, they are commonly suspended from an X or X/Y axis beam on a rigid structure. Coordinates in three axes are usually defined as X, Y and Z. Each axis is arranged at right angles to allow three degrees of motion. Gantries are further characterized by support at either ends or through the addition of a second member. Unlike arm style robots, gantries can easily scaled to larger proportions in all three axes. 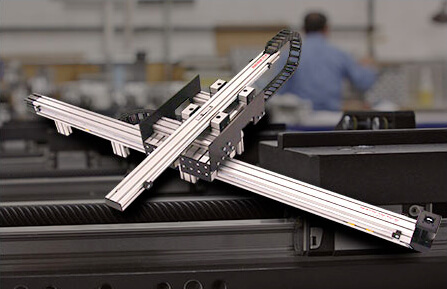 Gantry robots are especially suited for applications where additional orientation requirements are minimal or where or the parts can be staged before the robot picks them up. Both Cartesian and Gantry robots have a rectangular or cubic work envelope as opposed to articulated robots who like the joints in a human arm have limits to each movement and a specific arcing scope of motion. Their specifications are shown as degree of movement with large sweeping arcs with plots of positive and negative degree of movement rotating about the center of its base and the bearing of each axis. It is curious to note that workspace itself often has to be adapted to these unusual work envelopes as opposed to the robot adapting to the workspace. Because of their rigid lightweight structure, the Cartesian/Gantry Robots are very accurate and repeatable. Due to their simple structure, gantry robots are intuitive to program and easy to visualize when evaluating new automation. Most of all Gantry robots are configurable. From a plethora of motor and gearbox choices to components and materials these robots are prepared to take on the challenges of damp hazardous and dirty environments. The Cartesian Coordinate Robot’s relatively simple design and straightforward operation make it highly desirable in manufacturing. Because the individual axes can be easily replaced, downtime is reduced and maintenance costs are kept to a minimum. In addition, the entire system can be disassembled into its component parts for use in multiple single-axis applications. Most importantly, Cartesian Coordinate Robot systems are inexpensive compared to other more complex robots. Gantry robots have all their axes located above the work envelope which makes them ideal for overhead work processes. Gantry robots can be used to hold and position a variety of end-effectors such as those used in: PC Board assembly, dispensing, spraying, material handling, palletizing, pick and place, water jet, plate welding, friction welding, assembly, packaging, unitizing, Sorting, scanning, tray loading / unloading, camera positioning. inspection, glass cutting, printing plotting, laser cutting, flying knives, fastening and screw driving. It has been argued that the gantry is the real workhorse of modern industry. Think about it… millions of gantry robots have been packaged and sold into turn-key machines such as those used for assembling electronic components and robotic pick and place systems alone. 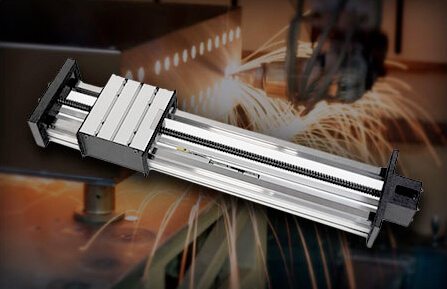 Even today, linear X-Y-Z gantries are the mainstay of the of machine tool co-ordinate measuring industries due to their accuracy and rigidity. This type of robot is especially suited for applications where additional orientation requirements are minimal or where or the parts can be staged before the robot picks them up. Often overlooked, the gantry robot is the mainstay of the modern automation industry and should always be considered for new automation due to its flexibility, efficiency and ease of implementation. 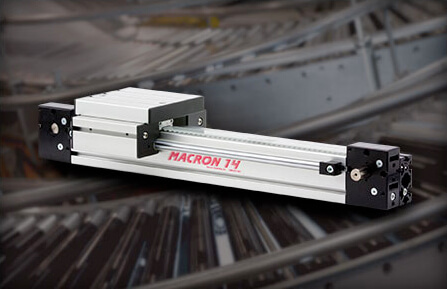 Contact a Macron representative today to learn how we can solve your motion challenges!